This candy is now closed, thank you for playing! Please see this post for the winner, but do enjoy this tutorial! Congrats, Louise! Please email me your snail addy and I will send you your copy of the "A Year of Flowers" stamp set! Now! I have a quick tutorial for you I am really excite about, which uses my recent set "Make a State-ment". I hadn't really had much of a chance to play with the "Make a State-ment" set at release time last month as I would have liked, certainly not this monarch butterfly*! You've probably noticed I intended it to be used not only with the "Stately Flowers" sets, but with all the floral sets I've done in the past. That one large butterfly really adds so much life to the card! 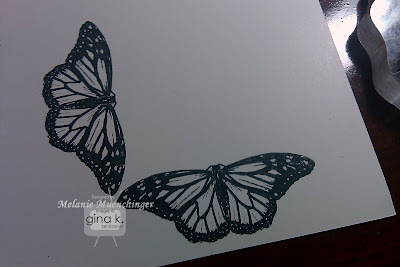 Once I started stamping it the other day, though, I noticed certain things about the shape and details that were unlike other butterfly images in my collection and had me seeing some new and pretty exciting ways to use it! Here is the first. Now trim with the scissors. Doesn't that make a gorgeous label/frame/pendant?? Perfect for this 4 1/4" square card! From here you can add an image, sentiment, or cut the middle out with another die to make a window for a photo stamp or greeting behind it. Here is my finished card. I want to make one in every color now! I went ahead and took pictures both ways with the sentiment layer straight or on the 45. Which do you prefer? I added white dots with an Inkssentials pen on the Black Onyx base to go with the dots on the wings and scored corner to corner on both Pure Luxury Red Hot layers to add interest. I used three Copics for the butterfly: FY1, Y17, and R35, layering ink from light to dark, then going back in with my lighter shade to blend the colors. The greeting is from my new "Stately Flowers 2". "Make a State-ment" coordinates with all the sets in the "Stately Flowers" series. I LOVE THIS! Can't wait to show you the next way to use it, I think it's sure to wow! :) How about another giveaway? Leave a comment below to win a signed copy of "Make a State-ment". (This set goes GREAT with "A Year of Flowers" by the way!) ;) Get an extra chance to win the set by linking this tutorial on your blog or Facebook! You can let me know you did by coming back and leaving a second comment. I'll announce a winner Tuesday! I like how your designs are versatile! I love butterflies too! Thanks for a chance. Oh wow! Melanie I love the way you did the butterflies! Never would have thought of that! I would love to win the book, then I can buy the stamp set to go with! Thank you for having this great blog candy, giving us a chance to win one, especially autographed! Hugs Lori R.
I don't think I saw this set! This is terrific! Perfect with so many other sets! Wow, this is really pretty! I love to see you think out of the box like this. Thanks for the trivia bit about Monarchs! What an awesome idea. Love the butterfly layout. Would love to win this set, so versatile. Wow! Wow! That butterfly pendant frame is gorgeous! Such a creative use of the monarch! I don't have this set yet so thanks for the chance to win it! So beautiful! I love the colours, so rich and vibrant. Amazing on cutting the beautiful butterfly frame, it looks lie a Spellbinders die. I think I like the sentiment squares on the diagonal best. It gives you an extra border with the white. I love this set. Thanks for them chance to win. I like the sentiment on the 45, because it gives it some special interest. 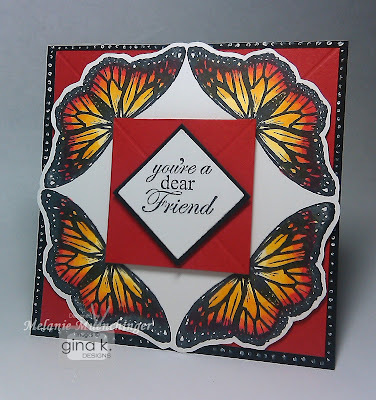 I've written a post about your new stamp set and your tutorial on my blog. Thanks for the opportunity. how beautiful! Love how you worked with those butterflies! Butterflies and flowers--can't ever seem to get enough. Love your work. love how you did the butterflies at right angles, its beautiful! Beautiful cards, Melanie! I like the sentiments both ways, it totally changes the look of the cards. I am a big fan of your stamps - I love your style. I'd love to win the Make a Statement Set. The Monarch is gorgeous. My mom is a collector of all things Monarch Butterflies! Her company name is Monarch Events! I am always on the lookout for Monarchs so that I can make special cards for her, but so many of the butterfly stamps are of different butterflies. Thanks for sharing all your talent with us. The best to you in 2012! Very cool way to make a frame. I like the first one best. What a great idea using the butterfly! Thanks for another chance to win some candy. Wow! Melanie the butterfly pendant is gorgeous and so creative!! You always amaze me!! That butterfly pendant looks amazing! I just love all of your creative ideas. I am loving this fun card. The map is fabulous! Great ideas! I love the tutorial. Love sentiments too so this looks like a great set. Thanks for the chance! I love the second one...guess that's the 45 degree one. Love butterflies, hope to win the set. Thanks Melanie for the chance! What a terrific idea for the butterflies -- wish I had your "eyes". I like the statment on the 45 angle, so that you can see all of the butterflies. Thanks for the chance to win the stamp set! Wow, who would have known what a great card this butterfly would make? I think I like the one with the white all the way around the sentiment. But, all are cool! It will be interesting to see other colors too. Thanks for sharing this with us! Oh my- this is so clever!!!! I am going to post this tutorial on my blog-I want to share your creativity!! !Thanks Melanie! I never would have thought to make a "frame" with the butterflies - will have to try that one. I think I like the 45 no I like the - oooo phooey I think they are both pretty. I posted on my blog and on FB! Woo hoo! Love the butterfly and what an awesome idea you have with the four of them. Would love to win the stamps, thanks for the chance. Am waiting to get my book, should arrive any day. AMazing - that is what you are! You have a way with flowers that is truly gifted! Love this!!! Can't wait to try it! Wow!! What a cool idea to make a frame from the butterfly. I love it and I think I like where you see all of the butterflies best, on the 45 I guess that would be. Can't wait to see more ideas. Mel, Imagine my great surprise to go to your blog and see my name as the winner of the "A Year of Flowers" stamp set. Now I have the set to go with your beautiful new book. Thank you so very much! This is incredible, so exciting, and such a blessing. Really like the butterfly cards and am partial to the second one. You are so creative! 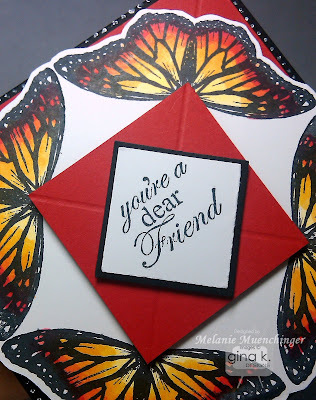 Wow Melanie what a fabulous idea I love how you did the butterflies!! Thank you for sharing. I posted on my blog and FB. Thank you for the chance to win such a wonderful set. Hi Mel! Thanks for sharing such an awesome tutorial - I can see using this technique with some of your other stamps as well! Your card is a beauty - love the sentiment on the 45. Make a State-ment is a fab set - great sentiments and all so versatile! Thanks so much for a chance to win! I would love, love , love to jave this set just for the butterfly if nothing else !! LOL But then I would love to have all your stamps. I do have a question that maybe you can help me with-I cannot find any Memento black ink ?? Can you suggest an alternative that will work with Copics ?? Thanks so much and Please Pick ME !! Melanie, I am amazed with your cards...Thanks so much for the tutorial!!!! Can't wait to see the next technique! I would love to win this set!!! You really cannot stop wowing people!! It is so inspiring for me as always! !Love how you did with the butterflies......and more!! Of course I would like to win the stamp set too!! LOL!! Beautiful, as usual. I may even have to try coloring again. NOT my strong suit! absolutely beautiful. I've said it before, I'll say it again. I am attracted to butterflies - they remind me of my mom because she loved butterflies. So butterflies bring back good memories and happy thoughts. How creative!!! Totally gorgeous!! !I don't have this set so winning it would be awesome! Thanks for giving us all a chance to win it.Congratulations again on your book!! Can't wait to try this beautiful layout. I just LOVE butterflies - especially the Monarch - because they are a symbol of resurrection; and your image is so realistic and beautiful! I also love to travel so this is a perfect set for me. It would be great to win it! 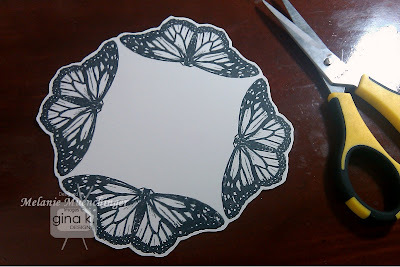 Your butterfly frame is wonderful - what a clever idea!!! hi, I posted a link on my blog. I posted a link to your blog on mine! Wow, this is SO pretty, Melanie!! I've so much to catch up on with your blog. Happy New Year!! Stunning card and technique - I love the second card the most. What a great design...must try this. Liked the second layout best. What an awesome idea of using these gorgeous butterflies. I do not have this set yet, so maybe I will win it :).. Have posted you on my blog. Thank you for sharing and giving of your talent. The card and butterfly are so gorgeous. Think you out did your self with this one, fantastic!!!!! Voting for #2 card, Such a gorgeous card!!! TFS! I certainly did not know that the Monarch is the butterfly for 8 states! Another wonderful set, Melanie, and I love the tutorial! Beautiful card, my friend! This is an awesome card!!! I love this set and how they all coordinate so well together. I would love to win this one but if I don't I'll have just have to buy one. I want to give this a try with the butterfly. What a really beautiful card. I don't have this set yet. but I do have your other ones which I love by the way. Your stamp sets are so beautiful to color and have endearing sentiments with them. Thanks for the chance to win this set! OMGoodness! I want your Make a State-ment stamp set so bad, I can't begin to tell you!!! Thanks so much for still more ideas about ways to use the Monarch butterfly. You're always so creative! I'd be jealous if I weren't so in awe of you. We raise ( or try to raise ) butterflies and moths from caterpillars. We love monarchs because they are beautiful, but also because they are interesting. They are poinsonout because of the milkweed plant that the caterpillars eat. They are also long-distance migrators. Your card is so cool! I hope I can get something close to it. 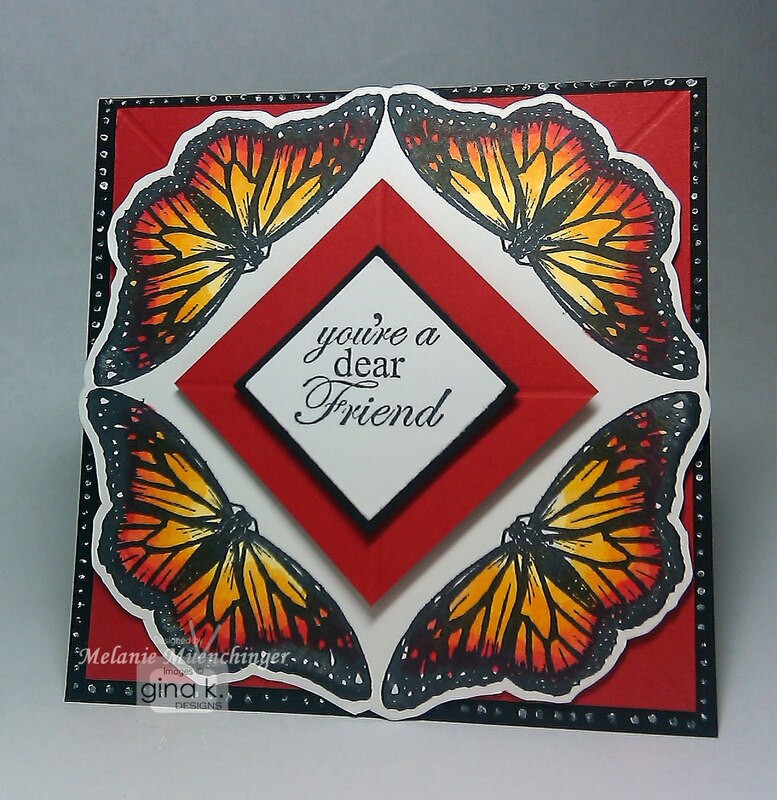 I love your idea with the butterflies, and esp the 2nd card because of the diamonds in the center - they're pronounced and you can see all of the butterflies, too. Beautiful card Melanie! Love the monarch butterfly last year I decided to plant flowers that butterfly's and hummingbirds like. I saw quite a few beautiful butterfly's but no hummer maybe this year. So I would definitely love to win this set. Gosh this is so pretty! (I flagged this set for my wishlist back at the release hop when it was introduced.) Thank you for the chance to win it. I have followed threw Gina K and hoped some of her blogs I had not known it was you that designed all of these stamps, You are a truely talented artist! What a lovely card! You are so sharing...thanks for the chance to win!!! This is great. Love the coloring. Would love a chance to win. Wow, what an awesome way to showcase our Gina stamps in different ways. Love that butterfly "label", Mel. I love, love, love this set! Mostly because it reminds me of my mom. She passed away in 2009 and was a huge Monarch lover. She taught Kindergarten for 35 years and every fall she and I would scour the ditches near our homes for milkweed plants in search of caterpillars that would become Monarach Butterflies. Every one of here students experienced the miracle of rebirth watching nature's wonder. My mom journeyed through cancer before her death and we'd often talk of it as her metamorphosis before her entry into heaven as a beautiful Monarch. THANKS for sharing such a wonderful set and creation! HI, I just found your site, I am so excited. How creative and beautiful. What a God given talent you have.